Popeye the sailor man had one, and so did Gandalf the wizard. While Sherlock Holmes had three, but not a calabash, the one synonymous with the deerstalker hat and monocle. When faced with a difficult case, the fictional detective would retreat to solve what he called a “three-pipe problem”, and he isn’t the only one, as the method of smoking has been favoured throughout history to aid relaxation and contemplation and spark mental ambers aglow.The likes of Albert Einstein, Joseph Stalin, Greta Garbo, Virginia Woolf, Ray Charles and Niels Bohr all enjoyed smoking a pipe, and were they alive today, there’s a very good chance they would be puffing away on a Danish one. Denmark has long been a hot-bed of pipe smoking and making, a culture that has been enjoying a second wind in recent years. 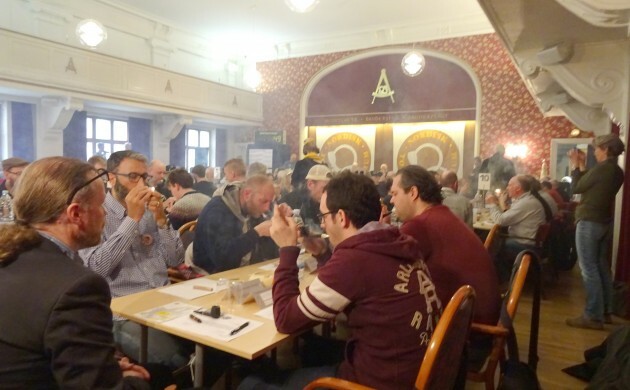 According to Michael Iversen – the head of the Nordic Tobacco Guild and the organiser of the recently-held 2016 Open Danish Championship in Pipe Smoking – its 38th annual edition, the pipes have never stopped smouldering. “Pipe smoking got big in the 1980s, and more than 400 participants took part in the tournament. Everyone smoked a pipe back then – prime ministers, lawyers and TV personalities – so there was a lot of focus on the culture of pipe smoking and everyone wanted to be a part of it,” he told the Copenhagen Post Weekly. Iversen contends that when smoking went out of style, there was no-one around to teach the younger generation how to do it and the number of pipe smokers decreased dramatically. But the culture has seen a resurgence in recent years, partly due to more Danes embracing a more refined lifestyle. “It’s part of the rise in people enjoying good food, good whiskey, good cigars and a refined lifestyle. People smoke less, but they smoke the best,” he said. For one of Denmark’s premier pipe makers, Nanna Ivarsson, the craft is a family affair. The daughter of noted pipe maker Lars Ivarsson and granddaughter of the legendary Sixten Ivarsson – also known as the grand old man of pipe making in Denmark – Nanna Ivarsson is one of the few female pipe makers in the industry. She also happens to be one of the best. Ivarsson produces about 50-60 pipes per year and her clients are solely based abroad: primarily in Japan, the relatively new market of China, the US, Russia, Germany and Switzerland. However, high-end pipes have yet to catch on in Denmark, she argues. The top pipes don’t come cheap. Anne Julie, one of the first female pipe makers, currently has a pipe for sale at over 13,000 euros – a tidy sum for most people. Ivarsson is among a select group of elite pipe makers in Denmark, which also includes the likes of Jørgen Nielsen, Erik Nørding, Tom Eltang, Nanna Ivarsson, Poul Winsløv, Anne Julie and Bjørn Thurman, to mention just a few. “It came very naturally to me because I was always in my father’s workshop and have met all the dealers and pipe makers since I was a very young girl. For me, making pipes is about my many years of experience looking at wood and embracing what the grains tell me. Spearheaded by the likes of Sixten Ivarsson, modern Danish pipe culture began in earnest around 1950, and there were once a number of cigar and pipe tobacco producers and small pipe factories dotted across the land. Iversen credits the traditionally large number of smokers in Denmark for the production of cigars and pipe tobacco and small pipe factories. But it could also be a question of longitude and latitude. “It has been discussed that the Danish climate – the temperature and moisture in the air – provides excellent conditions for pipe smoking,” he said. So, ‘God Røg’ [‘Good Smoke’], as they say in the Danish pipe community. This entry was posted in General and tagged Anne Julie, Bjørn Thurman, danish pipes, danish tobacco, denmark, Erik Nørding, Jørgen Nielsen, Lars Ivarsson, Nanna Ivarsson, pipe tobacco, Poul Winsløv, Sixten Ivarsson, smoking pipe, tobacco pipe, Tom Eltang. Bookmark the permalink. This sounds brilliant, nice article. Nanna, a female pipe maker, and a good one at that by the sound of it. Wish I could meet her. Happen to go to Denmark with the motorbike in July ’16, shall find out if the conditions for pipe smoking are as good as they say. They look in disbelieve in Ireland too, but I don’t care. In the end they come up to me telling me stories about great aunts/ grandmothers etc that they had that smoked pipe too. Don’t let a stare stop you from smoking your pipe blissfully, just stare back with your pipe in your mouth in the knowledge you’re doing something you enjoy. I am so pleased to know of Females involved in pipes making/smoking. I occassionally smoke one for relaxation but am too embarrassed to smoke one in public. People look in disbelieve to see a female smoke a pipe in the Uk! Your time will come Sheila! I’m sure it was only a few years ago before the pipe smoking ‘resurgence’ that no male under the age of 65 would have been seen in public with a pipe in hand. Now you can’t walk down certain London streets without bumping into a 30 something with beard and pipe!